While Steve Jobs famously panned the idea of a stylus for the iPhone at the device's unveiling in January 2007, Apple has continued researching ideas for stylus-based input, if only as part of continued reevaluation of how users interact with their devices and how technology will change those interactions over time. 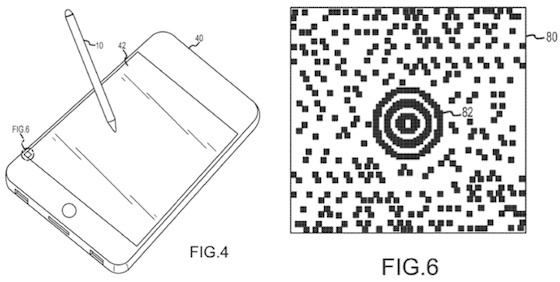 Toward that end, Unwired View highlights a pair of Apple patent applications filed in late 2010 and published today addressing optical and haptic stylus concepts. Apple's idea for an optical stylus takes advantage of a tiny camera on the tip of the pen that would allow it to track patterns on a device's screen that are invisible to the user's eye. The stylus could also incorporate other sensors such as pressure sensors, accelerometers, and gyroscopes to help determine orientation and movement. In some embodiments, a stylus is provided with an optical sensor, such as a camera, that is used in determining a location and movement of the stylus relative to a touch screen display of a computing device. It should be appreciated, however, that displays other than touch screens may be implemented in some embodiments. The optical stylus may be configured to transmit the location and movement to the computing device. In some embodiments, the optical stylus may be configured to process and/or filter the location and movement information prior to transmission, whereas in other embodiments, raw data may be transmitted. Alternatively, Apple suggests that it could incorporate haptic feedback to allow users to gain a tactile feel for the content on a device's screen via a stylus. Apple has researched haptics for quite some time, and the patent application published today describes how a haptic actuator embedded in the stylus could receive signals from a device to help users gain a tactile feel for the context of their onscreen input. Generally, input devices do not provide haptic feedback to a user in response to interactions with the input device. The user can typically only feel the rigid surface of the touch screen, making it difficult to find icons, hyperlinks, text boxes, or other user-selectable input elements on the display. An input device capable of generating haptic feedback may help a user navigate content displayed on the display screen, and may further serve to enhance the content of various applications by creating a more appealing and realistic user interface. "Haptic feedback" may be any tactile feedback. Examples include forces, vibrations, and/or motions that may be sensed by the user. There has been essentially no evidence that Apple is seriously looking at incorporating a stylus into its products, but it remains clear that the company is thinking about how such pen-based input could be used in novel ways. Research it all you want, please don't implement it. If Apple wants to move everyone towards tablets and touchscreens then they will need a stylus. Just like the massive number of professionals Wacom has catered to for decades. Ah, wait, I said professionals. Silly me. The best stylus is your finger. Going to disagree here. Do you think the best pen is your finger dabbed in ink? If I want to write on a digital screen (no doubt this is where technology will take us), I want an accurate stylus that mimics a pen as close as possible. However, I don't get all this haptic feedback BS. If you're going the stylus route (as a very useful accessory) then focus on the pen-like experience, please, Apple! Please Apple bring on an option for a Stylus ! This can't happen a minute to soon. Using your finger is like finger painting for a professional artist or designer. Graphics without a Wacom tablet is like gong back to kindergarden. 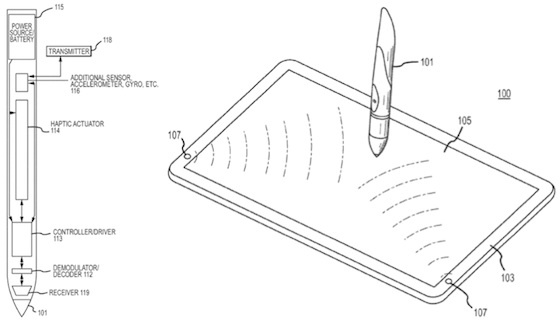 I am sure that Apple's patents are a way to get around all of Wacom's tablet patents. This is kind of like saying the best cutlery is your hands. Sure they're okay for eating sandwiches etc. but you wouldn't want to use them to tuck into a risotto or a steak. Steve said a lot of things and then proceeded to do the exact opposite. I always find it funny when people quote him like it was gospel. I want a pressure-sensitive stylus for an iPad so that drawing on an iPad actually makes sense.